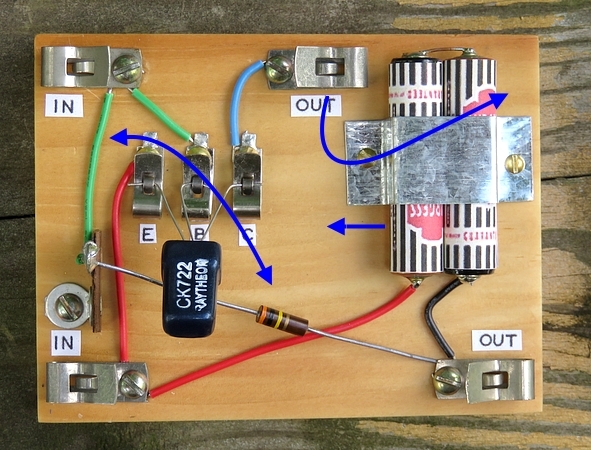 ֎ Why do we have a resistor with long leads floating in the air when it can swap places with the green wire? ֎ Why have an output clip in the middle of the board when it can be moved to the right to match it up with the other one? 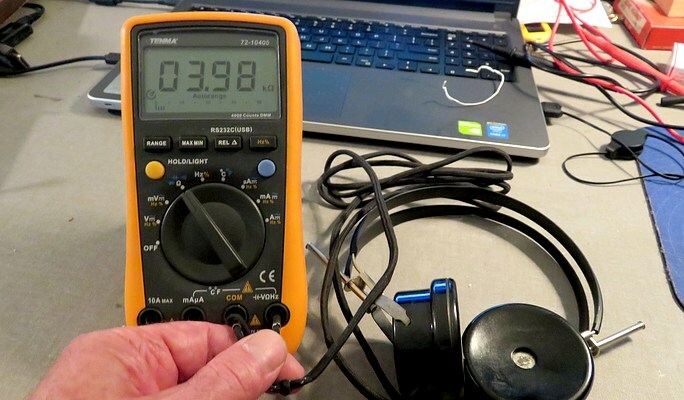 ֎ Why have 3 volts DC going through your super sensitive high impedance headphones?? 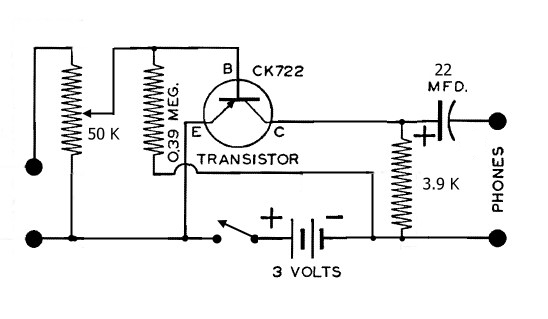 We can use a resistor in place of the headphones, then pick the audio off the collector of the transistor with a capacitor. That would get the 3V DC out of the headphones but then we need an on/off switch. Since we need to add a switch, why not add a volume control? 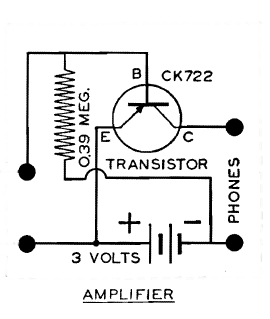 Original schematic and the new schematic with the four parts added. I had to work carefully because Alfred P. Morgan may be watching. Elmer Osterhoudt as well. I recently found out that the "O" in Osterhoudt is a long O. For years I have been calling him Ah-sterhoudt instead of Oh-sterhoudt. He spoke to me from the grave by way of one of his "MRL Radio Flyer" publications. 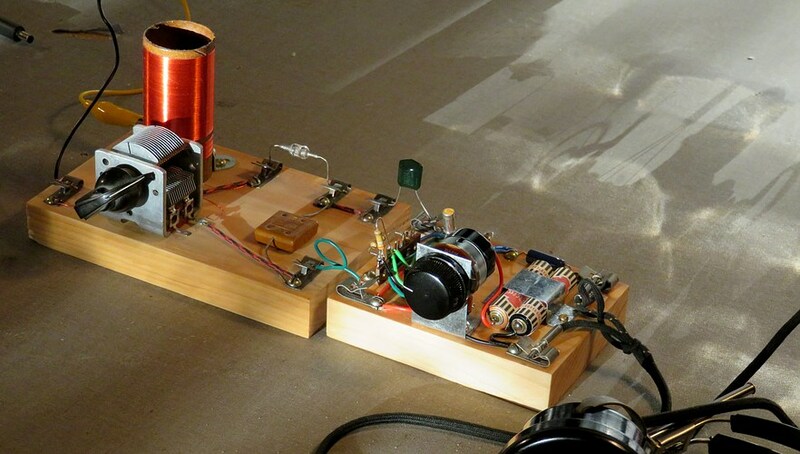 Here's the completed amplifier. Now we have a more serious rendition. 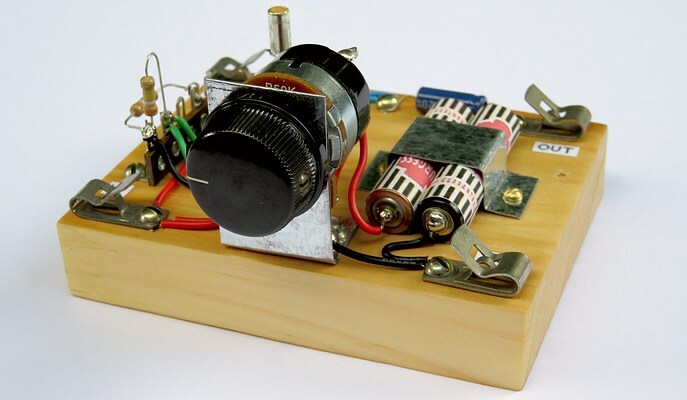 We can turn it on and off, control the volume and the 3 volts DC no longer passes through the headphones. Here's an ad for cigarettes!! Since they aren't allowed on TV, I thought I'd put one here. Come to where the flavor is, come to Marlboro country. Actually it's just there as a reference to show the size of the amplifier. I initially connected the volume control backward. It came on full volume and then decreased as you turned the control. It was a pain in the neck to swap the wires on the control because I had mounted it upside-down to keep dust out of it. Duh... When you turn it upside-down, the wire lug on the left is now on the right and vice versa. I had hoped it would drive a speaker, but it does not. I had to hold the speaker to my ear to hear it. It was, however, an improvement over the original design where I couldn't hear anything at all. By the way, the crystal set shown above is a Morgan set from the same book, "The Boys Second Book of Radio and Electronics." The crystal set in this photo is now coupled through a capacitor to the amplifier (green object, rear-center). Almost everything affects the performance of a crystal set, from the length of the antenna to what time of day it is. 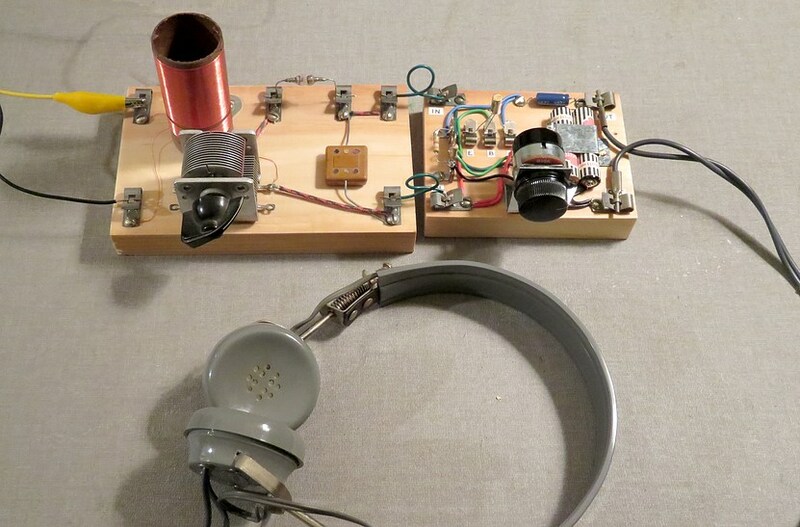 With just the headphones, the radio "sees" the impedance of the headphones. 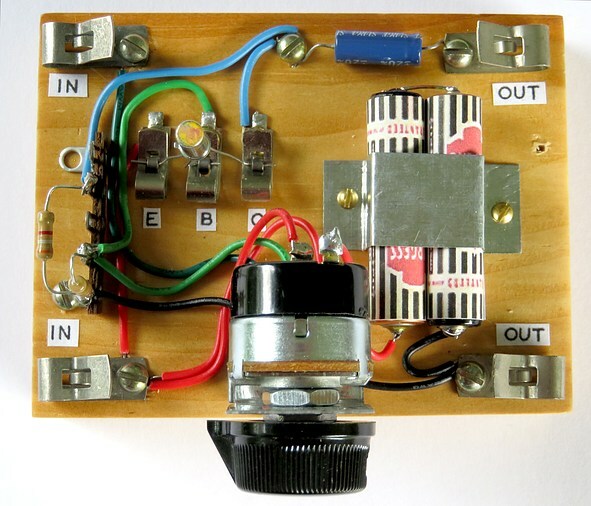 Directly coupled to the amp, it "sees" the 50K volume control. With a capacitor between them it "sees" hardly anything at all. Each scenario will affect the tuning of the set. As Mike Peebles would say, "Create, experiment, have fun!" Six months after making the Morgan Amplifier I came across a cool YouTube video. The video showed a real set of Burgess No. 7 dry cells. It seems my reproductions are not up to snuff. 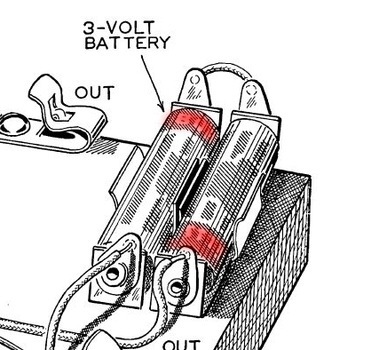 I didn't notice that Morgan had faintly rendered the red tops of the battery labels in his drawings. The good news is you will probably enjoy the video. An old Radio Shack catalog confirms the No. 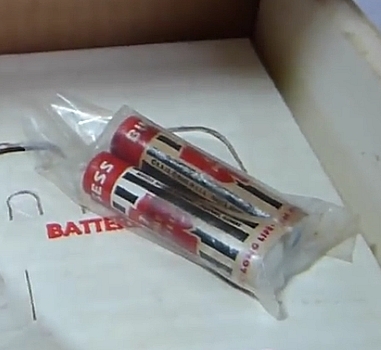 7 is size AAA and shows the word BURGESS on top of the dry cell.